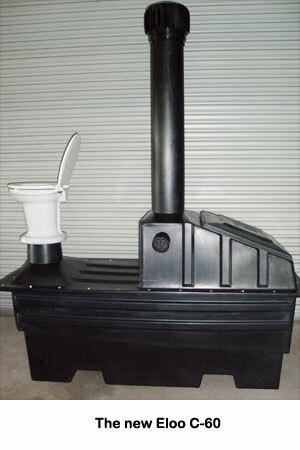 Enviro Loo - The AIR Toilet - by SWSLoo, Inc.
ELUSA-SWSLoo, Inc. is very proud to notify our customers that we are now offering 4 models of the Enviro Loo solar toilets - all MADE IN AMERICA. Our models are the R-15 Residential Model, the R-30 Residential Model; the C-60 Commercial Model; and the I-100 Industrial Model. These cutting edge solar powered toilets require no infrastructure - no water, no electricity, no chemical and no additives. Best of all, it produces no odor!! All of ELUSA-SWSLoo's models demonstrate our two fold commitment to our customers: 1) offering facilities ?> manufactured to meet the high quality expectations and structural sturdiness of American consumers; and 2) adding American jobs to the American economy. The Eloo R-15 Residential model targets smaller applications, i.e. hunting cabins; beach/lake houses; off-the-grid properties; small family (3-5 people) applications. Easy to assemble and install, this model is the smallest Eloo available to all customers worldwide. The C-60 Commercial model replaces the SWS-2020, and the SWS-2040, all outdated models. The C-60 Commercial unit is the model that we recommend for higher traffic areas, like National Parks, State Parks, Golf Courses, Boy Scout Camps, Girl Scout Camps, etc. Please contact us for any questions that you have on this model. The I-100 Industrial model is our largest model and is recommended for areas where there is a large number of people in a small geographic area, i.e schools, sports venues, concerts, prisons, etc. IMPORTANT NOTE: this model requires a site-built masonry vault constructed at the expense of the purchaser. Because of the costs of masonry construction this unit can be expensive. Be sure to check our site often to see pictures of new installations and find new Eloo News! For Eloo Sightings, check our Twitter and Facebook accounts which will reveal where and when we will have an Eloo near you! © 2019 SWSLoo.com, all rights reserved.